Nantucket Sleighride. A gm-less, card based roleplaying game for 4 players. I’ll probably come back at it next week with some better graphics. But I’d love to hear any feedback about it if you have a chance to take a gander and give it your time. Oof, Game Chef is never not a wild ride. Much thanks to Avery McDaldno and the crew that put it together. A card based, gm-less game for 4 people. Theme: No Book; Ingredients: Absorb, Wild, Glitter, Sickle. Theme: using a deck of cards for resolution and rule guides to be printed on cards. 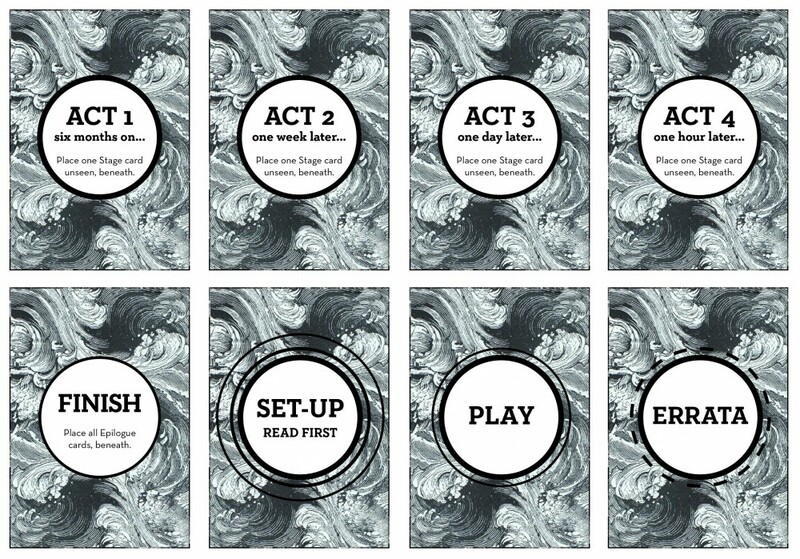 A story game of 4 acts, comprising of 3 scenes each. Players bid for role of Harpooneer and Navigator. 1/2 standard deck of playing cards, insert both Jokers (whales) and shuffle. 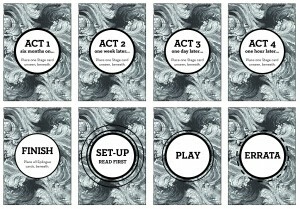 Blind draw 4 (of 6) of the Act cards (setting), place face-down in row. Deal Sailor (role) + Composure (color) to each player; final player picks from remaining. Blind draw 3 (of 6) Epilogues and place after 4th Act. Each player submits Four Conflicts to the a communal pot. Highest ranked sailor reads opening logbook entry by the captain. draws card from deck; makes first bid, playing at least one card from hand. Around Clockwise once to other players. Highest bid is the Harpooneer. Lowest bid is the Navigator. In the event of a tie, second player must play additional cards from hand to surpass original bid. Harpooneer draws two Conflicts from pool; selects one; returns other; and sets the stage between players; the vice in question is the drive for the scene. Navigator decides at any point in play which side will win, according to the unfolding narrative. Winner may bank a card; Loser draws a card from deck to hand. Previous Loser starts next bid; using this same format for 2nd, 3rd and 4th Act. Jokers are “whale sightings”. Played any time, Whale Sightings immediately interrupt play. Scene ends without victor. All players immediately discard their hands. Entire discard pile shuffled; returned to top of deck; all players dealt new 3 card hand. Person that played the card, the Whale Spotter must draw from the captain’s speeches and read one. At end of 4th Act, each player should add their banked cards. Highest has first choice of Epilogues. Last has their choice of remaining Epilogues.